The Cure return to North America to headline Riot Fest in 2014. Riot Fest Chicago, which celebrates its 10th anniversary this year, also includes Jane's Addiction, Social Distortion, Weezer, Billy Bragg, Mudhoney, Paul Weller, Patti Smith, Buzzcocks, Dandy Warhols, Stiff Little Fingers, Descendents, All, Thurston Moore, Afghan Whigs, and tons more! 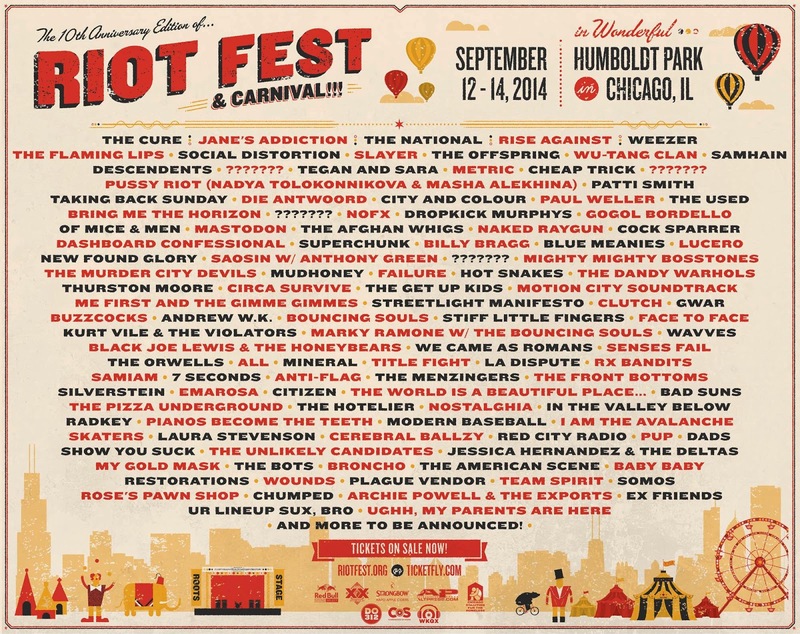 Riot Fest Chicago happens September 12 - 14th in Chicago's Humboldt Park. Three day passes are on sale at 9pm ET. Tickets for Riot Fest Denver, which happens September 19 - 21 also go on sale tonight at 9pm ET. Tickets for Riot Fest Toronto went on sale last weekend and are still available.